Kilchoman (and Jura) day at Feis Ile 2017 so it’s logical to post 2 posts, one for Kilchoman and one for Jura. However, I’m short of time today so instead I’ve opted to go for a single post on Kilchoman whisky. But we’ll still get two reviews as the post will cover a duo of young Kilchomans, both finished in Caroni Rum Casks, bottled exclusively for LMDW 60th anniversary. What’s so special about those bottles? Glad you’re asking. First of all, Caroni distillery isn’t your ‘average’ rum. It’s sitting in the opposite direction of Zacapa, Applelton and all those sugary rums. It’s like Islay peated whisky to the gentle speyside whisky. Or maybe should we say it’s like Port Ellen? because the second special thing here is that Caroni distillery was closed down in the early 2000s. So kudos to Kilchoman for sourcing casks of that closed distillery (and I hope we’ll see more whiskies in Caroni Rum casks). It’s also interesting to see the arbitrary age rule in action here. The difference between the casks is merely 3 months: the younger one filled into casks on 01.12.2011 and the older one filled exactly 3 months earlier on 01.09.2011 and crossing the 5 year old line by mere 5 days when both casks were bottled on the same day of 05.09.2016. 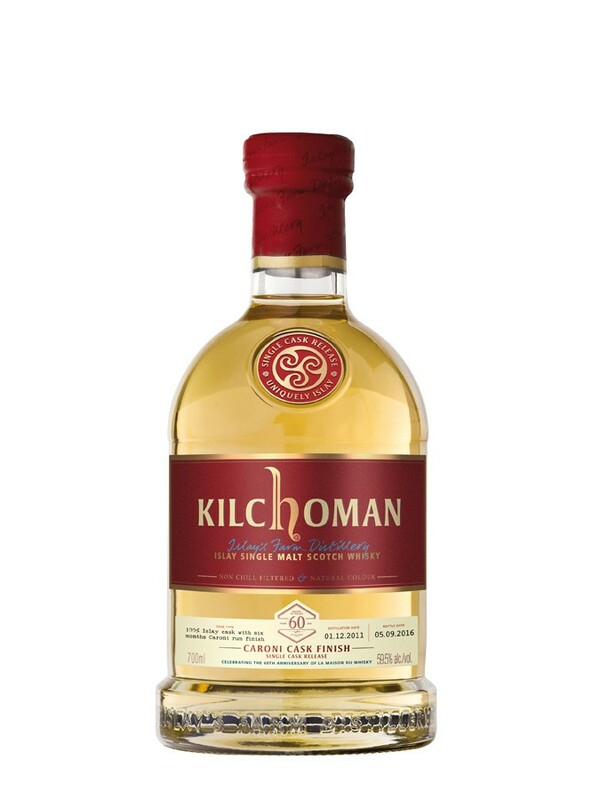 This entry was posted in Whisky Reviews and tagged Kilchoman, LMDW on June 1, 2017 by Yoav @ Whisky Gospel. This time – a sample from a obscure distillery, unknown to me (and probably to most of you as well) – Glentauchers. This entry was posted in Whisky Reviews and tagged Glentauchers, LMDW on September 16, 2013 by Yoav @ Whisky Gospel. Islay, my favorite island in the world and my whisky mecca. I have’t reviewed (yet) any whisky from the island and it’s time to fix that! Last week I was fortunate to get a set of 4 samples from good friend and the first one I tasted is this Caol Ila 1984 27 yo which came with rave recommendation. I always wondered how my approach to reviewing drams is impacted from the source recommendation. Yeah, I know, there’s difference when it’s an official sample provided from the distillery (or on its behalf) or if it’s a sample provided by friends or via samples swap – and still, I’m sure there’s some impact in the unconscious part of the brain. So it’s always a good idea to approach reviewing it (in all cases) slowly and try to judge it professionally and objectively. Of course, if the dram is indeed a very good one – there’s no doubt about it and no dilemma. But what if I don’t like it? Can it be blamed on different personal taste? Bad day at the office for the taste buds and nose? or just prejudice? What should one do then? Not an easy spot to be. So how good is this Caol Ila? Were we in agreement or not? Nose: Woosh – Alcohol bang (56.1% shows some muscle here) and Islay peat baby! Initially some acidic/sharp solvent which disappears quickly, and then the stage is clear and earthy peat rules the stage with background notes of vanilla, lemon custard. With a drop of water, the fruits notes get stronger – sweet candied citrus and lemon. Palate: Initial burst of oak and vanilla, spicy peat – not as strong as on the nose and again the sweet candied citrus and lemon which once again get stronger when water is added. Finish: Long finish, lingering peat and oak – very mild and gentle oak impact for 27yo old whisky. Undercurrent of the sweet citrus/lemon once again. Conclusion: It’s always great to see long aged whisky which behaves and tastes like young one – fresh and lively. This one is one cracking Islay malt – what’s not to like here? high ABV delivers the flavors in maximum settings, peat, great oak impact and sweet fruits. Heaven! Good thing I didn’t land in some uncomfortable spot here. This entry was posted in Whisky Reviews and tagged Caol Ila, LMDW on August 7, 2013 by Yoav @ Whisky Gospel.